Multiple methods can be used to upload data to Workplace OnlineWorkplace Online is the web portal that users within a team can use to access their data and administer their team..
To upload items using Workplace DesktopAlso known as the Workplace Desktop app, and in the context of this documentation, simply "the app," Workplace Desktop is the software installed on a computer that is responsible for synchronizing data between the local drive and the cloud., refer to Workplace Folder. To upload files from a location other than the Workplace"Workplace" describes the Autotask Workplace service in its entirety. Folder, refer to the Folder Sync Tab. Files can be dragged and dropped in any browser. Refer toSupported Browsers. Multiple files can be dragged and uploaded simultaneously in all browsers. Only Google Chrome, however, allows you to you to drag and drop folders. Log in to Workplace Online. When you are viewing a page within a project, the files will automatically upload to the current location. When in any other view within Workplace Online, a pop-up window will be displayed, allowing you to select the location to which to add the file(s). Click on View More Details to see details for the files being uploaded or to cancel current uploads. If you drag and drop more files into the browser window, they will be added and the status bar will be updated to reflect this. You can continue to work within Workplace Online and the files will continue to upload - however, make certain to remain logged in to Workplace Online until the upload has completed! Navigate to the location where you want to store the files. In a list view, right-click the project or folder you want to upload to and select Upload. Simply drag and drop the files to the upload area, or click Select Files to Upload to launch the file browser and select the files to upload. Files can be dragged and dropped in any browser. Multiple files can be dragged and uploaded simultaneously in all browsers. Only Google Chrome, however, allows you to you to drag and drop folders. 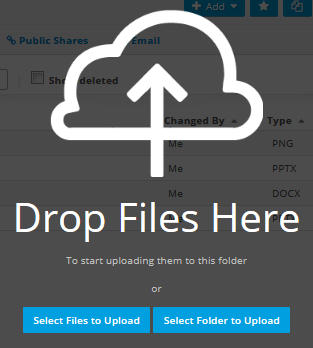 Refer to Upload Files to a Project or Folder via Email.